Jerome Moross was one of the most original voices in 20th-century American music. Along with Aaron Copland and Virgil Thomson, he sought to create an authentic musical vocabulary rooted, at least in part, in the folk traditions of this country. We knew him best from his Oscar-nominated score for The Big Country (1958) but Moross actually worked in every arena of American music from classical to chamber to theatre. His Broadway masterpiece was The Golden Apple (1954), which was years ahead of its time, combining aspects of musical comedy and opera. The book and lyrics were by the estimable John LaTouche. For the first time, there is now a complete recording of the work and, in my introduction, I offer some historical and musical context. 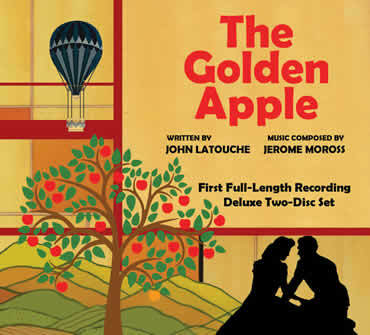 This entry was posted in Composers and tagged Jerome Moross, John LaTouche, PS Classics, The Golden Apple on June 13, 2015 by Jon Burlingame.